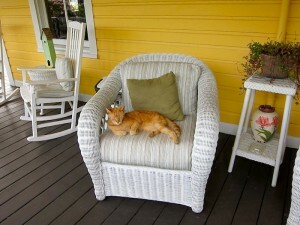 Connoisseurs consider the Coombs House Inn one of the best B & Bs in all of Florida and I know why. 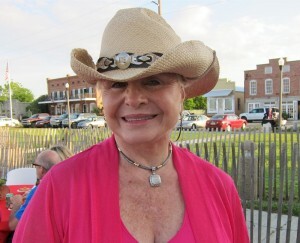 Her name is Lynn Wilson. 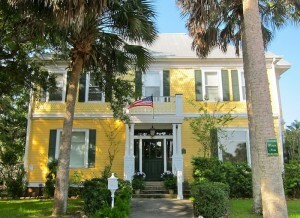 Lynn, an architectural interior designer and decorator, discovered the house that would become the inn when vacationing in Apalachicola, Florida, in 1978. At that time, the mansion was uninhabited, boarded up and deteriorating. There was talk of condemnation. Of course, it wasn’t always that way. When James N. Coombs, “the wealthiest businessman in Apalachicola,” built the mansion in 1905, he loaded it with luxuries, such as black-cypress paneling, ornate brass light fixtures, nine fireplaces, leaded glass windows and indoor plumbing. The local newspaper declared it “the most elegant house in town.” But the glory faded through the decades, first fueled by a fire in 1911, and then by various occupants who finally abandoned the property in the 1960s. Neglected, dilapidated, decaying, the house enchanted Lynn Wilson, who with her airline executive husband, Bill Spohrer, couldn’t resist buying it. With a resume that lists renovating and decorating luxury properties all over the world (client list includes Taj Hotels, King Hussein and Queen Noor, Donald Trump and Jackie and David Siegel—yes, the same featured in the documentary film “The Queen of Versailles”), Lynn not only restored the building, but also filled it with fine antiques, oriental carpets and original paintings. She also shocked locals by painting the exterior a sunny yellow, a daring deviation from the mosquito-repellent white of surrounding properties. 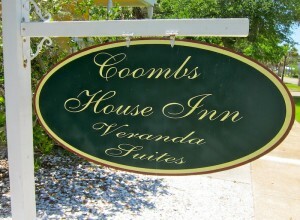 Coombs House Inn opened to guests in 1994. As you can imagine, the inn’s reputation and popularity blossomed, encouraging Lynn and Bill to purchase another nearby Victorian mansion, which went through the renovation/decorating process to emerge as “Coombs Villas” in 1998. A third historic house, now called “Coombs Veranda Suites” joined the enclave in 2007. Today the three houses that make up the Coombs Inn combine considerable turn-of-the-century charm with comfortable contemporary updates. Although each of the 23 rooms vary in size, decor and accoutrements, all boasts full baths, cable TV, Wi-Fi and Starbucks coffee for in-room coffee makers. Breakfast and afternoon tea greet diners in the gracious dining room and extras come in the form of bicycles as well as beach chairs and towels that guests can borrow for trips to the nearby sugary-sand beaches of St. George Island. 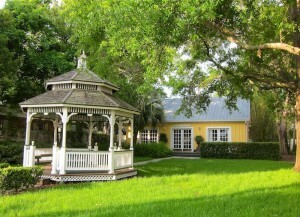 In addition to individual travelers, the B & B accommodates groups, as its garden gazebo and Camellia Hall provide a lovely venue for weddings, meetings and all type of gatherings. 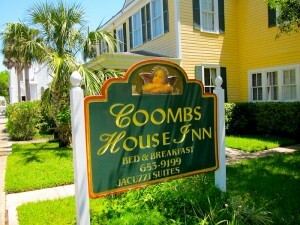 The Coombs Inn sits a few blocks from the heart of Apalachicola, with easy access to all that the quaint fishing-village has to offer. Guests can wile away their stay sitting on a genteel verandah with a good book and glass of wine or can partake in area activities such as biking, hiking, kayaking, fishing, sailing and swimming in the Gulf. And as icing on the Apalachicola cake, the inn is within walking distance to a treasure trove of good restaurants (click HERE for one great suggestion). Preheat oven to 350°F. Line a 9-inch pie plate with pie crust. Arrange sausage patties over bottom of pie crust. Beat eggs with half and half, salt and pepper until well blended. Toss cheese with flour and stir into eggs. Pour mixture over sausage in crust. 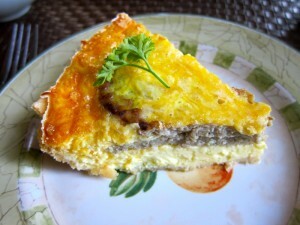 Remove quiche from oven and set aside for 5 minutes before slicing. For more information about Apalachicola, St. George Island and other Franklin County delights, see http://www.saltyflorida.com/.